Nothing suitable in promotional bag hooks? How about custom branded environmental bags, logo printed corporate money clips or one of our promotional bags? 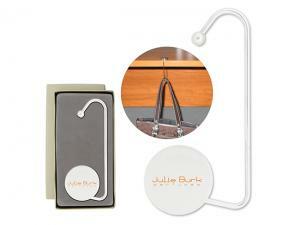 Promotional bag hooks are an ideal way to display your logo in coffee shops, bars and restaurants. Promotional bag hooks are an essential woman's accessories and are definitely used and appreciated. Bag hooks with your custom logo print are a great loyalty gift for magazines, business to business promotions or mail outs and magazine inserts! You can't go wrong with these cool promotional products with logo!